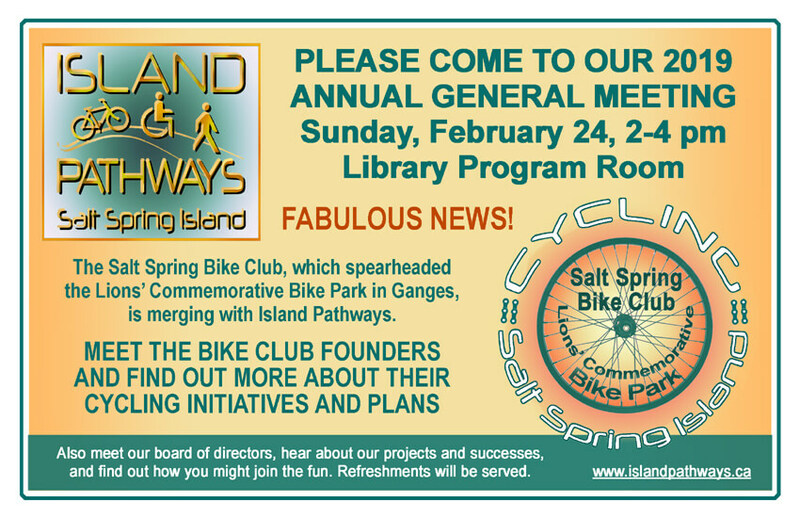 With great enthusiasm and anticipation, the Salt Spring Bike Club announces its merger with Island Pathways and the creation of the new Island Pathway committee: Cycling Salt Spring Island! The Salt Spring Bike Club formed five years ago to: promote cycling as a healthy, sustainable and fun mode of transportation and recreation; foster a stronger cycling culture on Salt Spring Island and create and advocate for safer cycling opportunities for riders of all ages. Its first project led to creation of the Bike Park in Ganges, with generous funding from the SSI Lions’ Club and SSI Parks & Recreation inputs and maintenance. In the summer of 2018, it opened, a network of technical trails nestled into a treed area in the SE corner of Mouat Park. Since opening last August, the Bike Park has been well used by cyclists as young as two and as old as 70. In the fall, up to 20 riders could be spotted in the park at a given time. Spring will be busy again, guaranteed. The Bike Park clearly shows the community’s appetite for safe cycling facilities. Its success inspired the Bike Club to look for further opportunities to improve cycling on Salt Spring. Island Pathways mandate fits well with Bike Club goals, and complimentary assets span the two groups. There is a lot of good work to do. 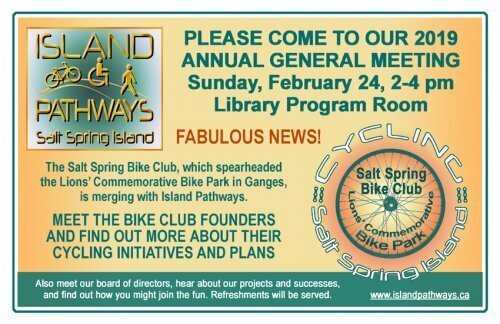 If you’d like to know more or maybe lend a hand, please come to Island Pathways Annual General Meeting – see notice – to meet with the new team, enjoy their presentation, then join in a discussion of all things Cycling Salt Spring Island.